Tony Morrison entered the Real Estate Industry in 1988 and over the last 23 years has achieved almost everything that could be achieved within the Real Estate Industry. Throughout the 90’s Tony won the Tasmania Multi List Sales Person of the Year 8 years in a row from 1991 to 1998, as well as being the Professionals Top Sales Person from 1990 – 1999. In 2001 Tony, together with Scott Morrison and Kirsty Dunphey, set up M&M Real Estate and within 3 years the company was honored by BRW in their Annual Top 100 List of fastest growing companies in Australia. In 2003 Harcourts approved Tony to re brand and grow the franchise group throughout Tasmania. 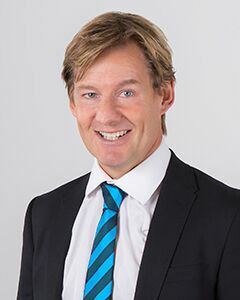 In the role of CEO for Harcourts, Tony has taken the group to 24 offices throughout the state, by far the biggest franchise group in Tasmania as well as facilitating the setting up of Harcourts Rural Tasmania and NAI Harcourts Commercial. Today Tony remains an owner of the Launceston and Longford Harcourts offices and is still involved in listing and selling houses for clients he first met 23 years ago, as well as running the biggest Real Estate Group in Tasmania.